Over New Year I have been corresponding quite a bit with pianist Noriko Ogawa, who has almost finished translating my book ‘Out of Silence’ into Japanese. Though I am really looking forward to the Japanese edition, due out in spring, I am rather sorry that the stream of interesting questions from Noriko will now dry up. I have never worked closely with a translator before and, though I realise she has spared me as many questions as she can, I have found it delightful and thought-provoking to be quizzed about my ‘meaning’ by someone from a different culture. 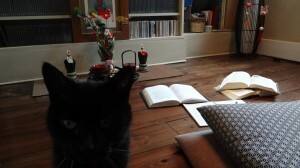 While she was working on the translation this week, Noriko sent me this charming photo of her little black cat watching over her, with Japanese New Year decorations in the background. You can see my book on the floor, as well as Noriko’s dictionaries and the notebook in which she writes her translations longhand. This entry was posted on Wednesday 4th January 2012 at 12:10pm	and is filed under Books, Daily Life, Inspirations. You can leave a response, or trackback from your own site.